I look pretty good… for a grandmother. 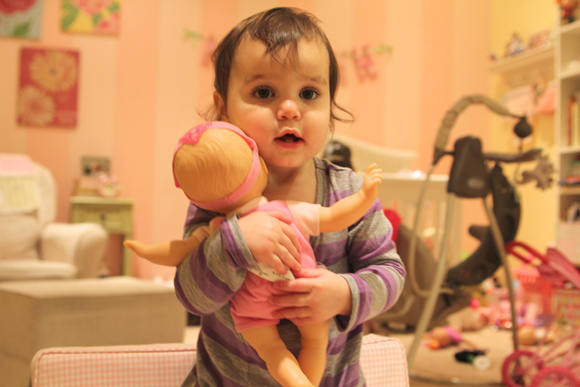 Madelyn received two babydolls for Hanukkah and has since taken motherhood very seriously. Sigh. There’s nothing like watching your daughter become a mother. 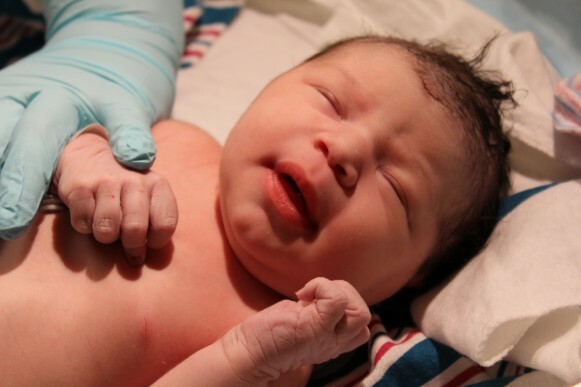 Thankfully, the birth was easy, like tearing paper off a box, and there are no diapers to change because the fabric crotch is stitched on pretty heavily. The babies don’t sleep, but they’re also never awake, so ya know, Madelyn is a well-rested mama considering her two-week-old newborns in the house. It’s actually pretty fascinating watching Madelyn mother the fruits of her… imagination. She talks in soft, playful Madelynese (Madelyn language) to them. And she pats their plastic-grooved hair with such toddler tenderness (read: like Ringo on his instrument). She carries them everywhere with her, never letting go, even if upside down. Her nurturing skills are so innate. I wasn’t there for one of the births (Bryan and I were out on a date when the baby was born/gifted by Mimi), but I was told that as soon as Madelyn could have skin-to-plastic with her new baby, she instinctively picked up the plastic pink bottle that came in the doll box/the hospital provided and brought it to the baby’s mouth for the first feeding. I know I’m a little bit biased, but holy mother of dolls, my daughter is brilliant. I love watching her with her baby dolls. She loves to push them in the stroller and she even rocks them side to side and sings. Is this imitation? Is this nature? I don’t know, but it’s pretty effing cool. Mother and daughter bonding with singing and laughter. Hey doll, I just met you. And this sounds crazy. 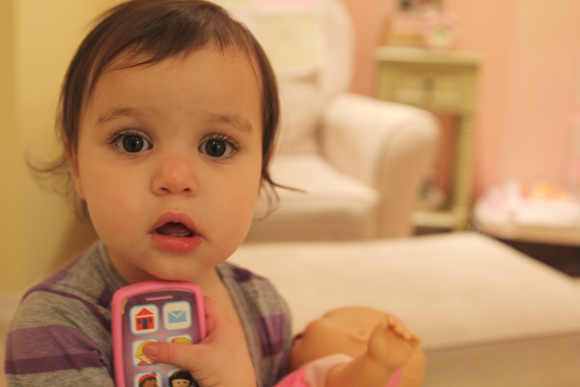 But here’s my Fisher Price Cell Phone. So call me, maybe? Madelyn showcases her instinct: even when she falls off a padded chair that’s 7 inches from the carpet below her, she maintains her grip on her baby, never letting her get away. As they say: It takes a village. Madelyn puts her baby into a milk coma. Smart mama. And then, just when I put the camera down, I put the video camera on to capture the ultimate bottle feeding. Rookie moms, take note: THIS is how to be a Jewish mother and make sure your child eats. Your posts are hilarious, and your daughter is ridiculously delicious. I would read ANYTHING you write…you are just so damned entertaining. Madelyn and Princeton are now very aware of each other and it makes this mama’s heart smile with girl squeals as the soundtrack. Princeton gets to know his sister minutes after we are reunited at home. Whenever I’m carrying Madelyn, Princeton follows us around the house and hangs out in her room when we play. When she reaches for him, he doesn’t totally hate it. I mean, he kind of hates it, but that’s because he’s a scaredy dog and doesn’t do well with grabby hands from any kind of human — young or old. But at least he sort of tolerates it without any kind of retaliation. Yesterday, I was watching both the furry child and fleshy child playing independently. 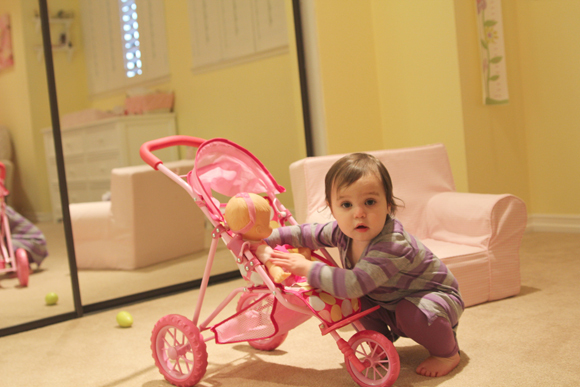 Madelyn was exploring her room and picking up every object possible to inspect it and decide if it was mouth-worthy. 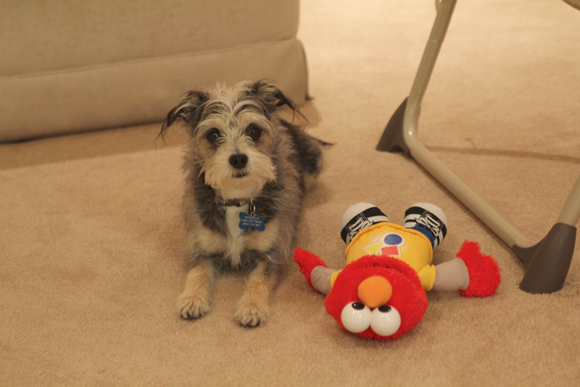 She came across Princeton’s stuffed squeaky dog as he watched from a few inches away. She touched one end of the stuffed squeaky dog and Princeton took that as her intent to play. So he grabbed the other end with his teeth — gently! — and they had a mini tug-of-war with the toy. Princeton won. But that’s besides the point. It was so cute how Princeton assumed that her touching his toy meant that she wanted to have a game of fetch and Madelyn, well, damn, she just wanted to touch stuff. Lately, I’ve noticed that Madelyn’s door goes from cracked to full on ajar during her naps. I think he’s going in there to check on her while she sleeps, which is totally warm-fuzzy until her usually-2 hour mid-day snoozes are cut in half because someone’s collar jingle-jangles too loudly. Uncool, Pdog. However, all of Princeton’s approvals of Madelyn started before Madelyn even came home from the hospital. I just came across this video that Bryan took when he went to our cousins’ house who were watching him while we were in the hospital when Madelyn was born. 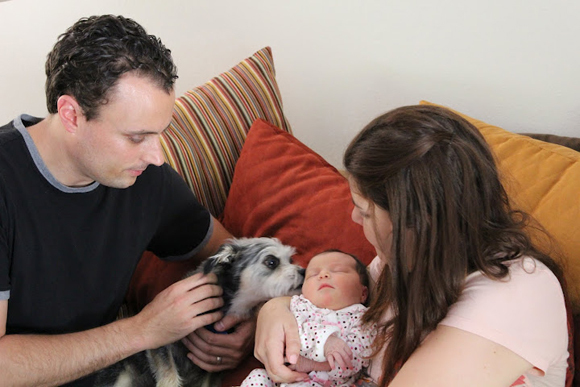 It was the first time Princeton had seen Bryan in three days and he had no idea what was in store for him when he’d return home. I think it was love at first sniff.